On a sunny autumn day off we nipped down to Portobello beach for a quick walk. There is something about Portobello that is good for the soul. Views to islands, the sea lapping against the breakwaters, dogs running everywhere on the beach, plus a real sense of community…. There was not one, but two choices! Both served with a great smile and friendly service and eaten with a delicious view. The two cakes were a very tasty: a moist orange polenta and a zingy and very tangy lemon drizzle (my favourite). These were washed down with a really good cup of tea sitting on a breakwater in the sunshine. It was like a one hour mini beach holiday with some really good gluten free cake thrown in. The cakes are made by the Manna House Bakery on Easter Road (http://themannahousebakery.co.uk/) which is a great looking place and I shall certainly visit. The cakes were completely gorgeous, the company as delightful as ever and to enjoy afternoon tea on the beach was just a brilliant escape. 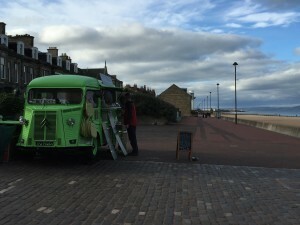 The Little Green Van is worth a trip to Portobello in itself. It embodies that Portobello vibe: a great friendly community with a slight edge of the alternative.